The Short Version: A few miles west of Seattle sits one of Washington’s most treasured coastal getaways: The Kitsap Peninsula. This idyllic destination has many beaches, bike trails, breweries, parks, and ferry services to delight daters in search of a romantic weekend away. If you live in the big city and hanker for a scenic date spot, you can escape to the quaint towns, marinas, and islands of Kitsap Peninsula region. The spectacular mountain views, family-friendly activities, lodging, and trendy dining scene keep people occupied as they spend quality time in a place unlike any other. Whether you’re there for a day or a week, the Kitsap Peninsula region will provide a unique laid-back atmosphere for your leisure time. Known for its beachfront suites and miles of hiking and biking trails, Washington’s Kitsap Peninsula gives city dwellers the chance to get away from it all for a few hours or a few days. People often visit this area, which is just 30-minutes from downtown Seattle via the iconic WA State Ferry to enjoy scenic vistas and coastal cuisine. Nearly every town in Kitsap the is located on the waterfront which means both residents and visitors can enjoy going outdoors and being in the middle of the action. The region is also home to major military bases that contribute to Kitsap 6,700 jobs related to outdoor recreation. The 371 mile Kitsap Peninsula National Water Trails is the only official National Water Trail in WA State designated by the US Department of Interior. In addition to miles of kayak, SUP and sailing activities, young couples can also enjoy miles of cycling, mountain biking during the day and then unwind at an arcade bar at night. The Kitsap Peninsula has everything you need to relax — from, low-key craft breweries to sandy beaches — and it’s all affordably priced. The Kitsap Peninsula isn’t about luxury hotels or fancy dining — it’s about taking a step away from big-city life and relaxing in a beautiful seaside oasis. You can save money by staying at a pet-friendly motel or go big and book a room at a casino hotel. From traditional hotels and B&Bs to Airbnbs and VRBOs’, Kitsap Peninsula lodging options cater to outdoor recreation minded people and military folk who like to wake up early and get active. It’s a no-muss, no-fuss atmosphere that gives daters the privacy to take a break and experience the towns and the surrounding area at their own pace. From soda bars to sushi bars, Kitsap Peninsula has no shortage of places to hang out and have a drink with a loved one. The area is home to many craft brew legends, including Silver City, Sound Brewery, and Hood Canal. Open seven days a week, Bainbridge Brewing is a popular spot for couples because of its dog-friendly, kid-friendly, and just-plain-friendly vibe. You can have a pint or a tasting flight to experience the old-fashioned, hand-crafted ales typical of this area. Some places feature live music, so you can swing by with a date for a drink in a jazzy atmosphere. The Manette Saloon is the Kitsap Peninsula’s premier rock-music venue. Located in Manette, just across the bridge from downtown Bremerton, the laid-back tavern serves up grass-fed hamburgers and pub-inspired comfort food as well as an extensive selection of Northwest microbrews. Its historic stage has featured talented performers, including Soundgarden, MxPx, and Magnetic North. In recent years, arcade bars have become the trendiest places for young couples to drink, play, and be merry. At these unique spots, you can challenge your date to a game of Pac-Man or pinball in a lively setting. Another Castle Arcade Edition offers a full bar, a delicious menu, and dozens of retro arcade games. The bar even hosts tournaments to encourage the best gamers to get out of the house and have a good time. With 371 miles of shoreline and dozens of public waterfront parks, it’s easy to see why the Kitsap Peninsula attract visitors from across the state and the country. Couples can stroll idly along the shore or take a kayak, canoe or sailboat to enjoy miles of calm, natural waterways. The lovely bays and inlets offer scenic vistas that inspire romance all year round. Downtown shopping areas and public parks are usually within a block from the water, so couples can spend a day out of doors and then enjoy the attractions of the city. Plus, if you want to take the whole family along on your getaway, everyone can find something to entertain them at the Kitsap Peninsula. “We’re known for being super kid-friendly and pet-friendly,” Patricia said. “We have a lot of people who like to bring their bikes and go cycling. It’s a big cycling area.” A lot of the hotels allow guests to bring bikes into their rooms to make having a biking adventure even easier on out-of-towners. Kitsap Peninsula recently added 4,000 acres to the Kitsap Forest & Bay Park that now includes nearly 6,000 acres of public land for mountain biking and other outdoor recreation. You can scout out nearly 100 trails on this interactive map offered by the MTB Project. During clear-weather days, biking is a coed activity that’s great for outdoorsy couples (and their families) who want to explore the Washington coastline, forests, and rural areas on their own time. One of Kitsap Peninsula’s biggest attractions, especially for folks who live inland, are rides aboard the icon WA State Ferries crisscrossing the local waterways. Four routes serve the Kitsap Peninsula; Seattle to Bainbridge Island, Seattle to Bremerton, Edmonds to Kingston and West Seattle to Southworth/S.Kitsap. Some of the ferries serve wine and beer while they cruise along to nearby ports. Hansville is a popular destination with a lot of nature trails, public beaches, and sightseeing stops. Built in 1879, the Point No Point Light is the oldest lighthouse in Puget Sound. Couples can book an intimate vacation rental at this historic place to take in a panoramic view of the water. A quick ferry ride can open couples up to local sights, sounds, and experiences in Washington. The Historic Carlisle II Foot Ferry takes visitors on 10-minute tours between Bremerton and Port Orchard. It only costs $2 each way, so you don’t have to spend very much to take your date across the calm blue waters of the Sinclair Inlet. Over the years, the ferries have hosted many romantic moments, including proposals, weddings, and anniversaries. 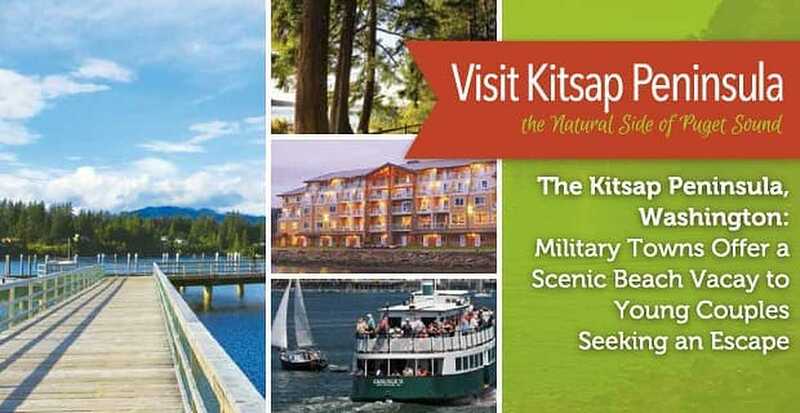 Kitsap Peninsula region is more than a collection of naval bases and military installations — it’s a budget-friendly getaway for city dwellers of all walks of life. Whether you’re planning a daytrip or an overnight stay, the townships in this area provide many opportunities to connect with your significant other and create lasting memories. Patricia told us that because Seattle is “growing like crazy” that this scenic waterfront destination has become a popular getaway for people that just want a quick escape from the urban scene. Every day the region is adding more restaurants, hotels, and trendy spots for residents and visitors to enjoy. If you’re looking for a leisurely vacation spot, you couldn’t do much better than the Kitsap Peninsula. The area offers the best of Washington state from its coastal waters to its award-winning craft breweries and wineyards.